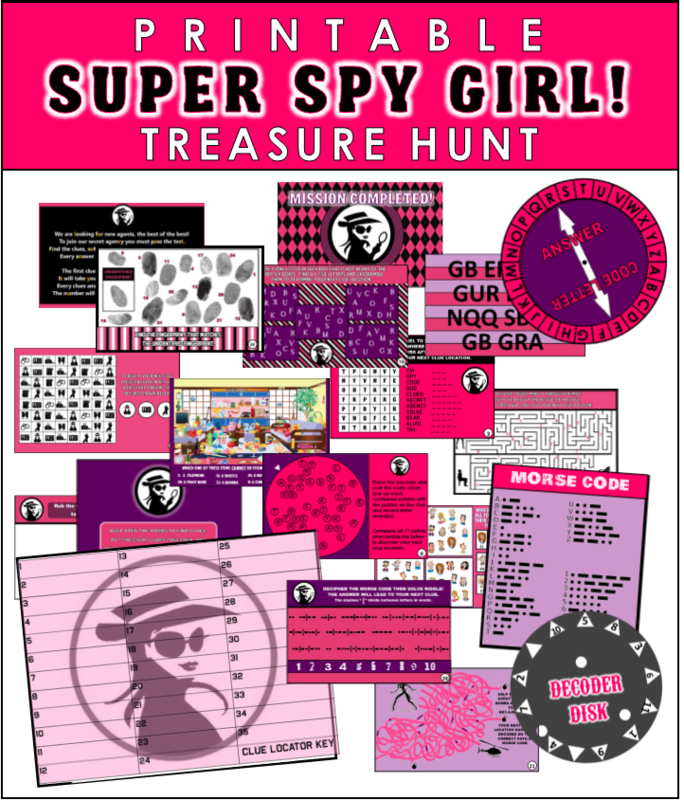 Printable super spy girl treasure hunt! 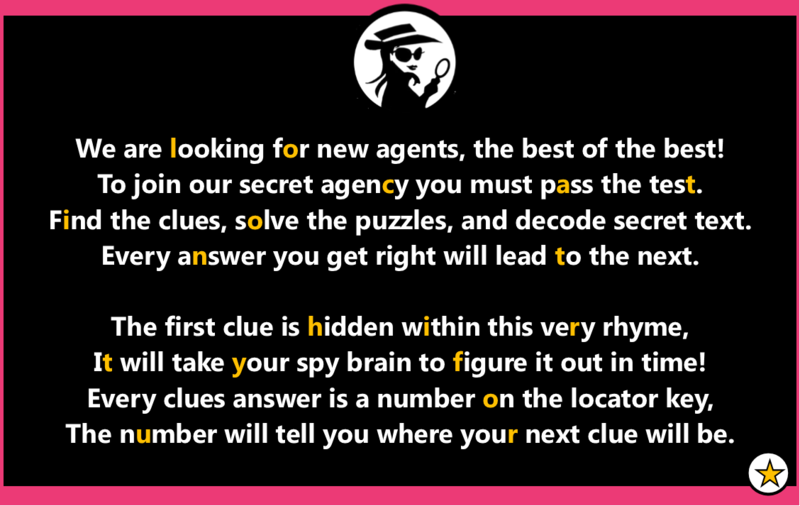 I created this printable secret agent / spy treasure hunt because what is a spy or secret agent without a top secret assignment? This treasure hunt is packed full of a variety of different clues and puzzles for the guests to solve. I have included 2 different sets of clues one is a bit easier than the other. 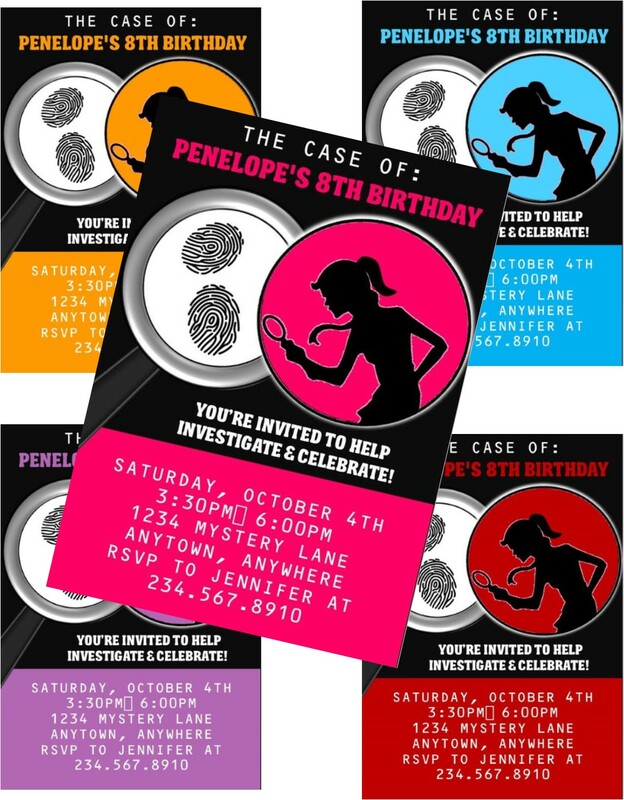 You can choose which one is best for the little spies attending your party. The best part about this treasure hunt is that IT CAN BE PLAYED ANYWHERE! You decide the hiding locations. I created it so that you can determine the hiding spots without having to change the clues or create new clues for each different location. 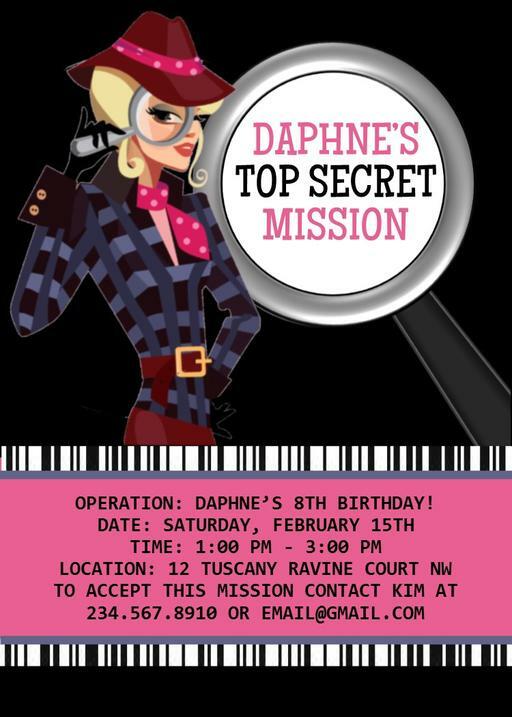 WHAT DOES THE PRINTABLE SUPER SPY GIRL TREASURE HUNT INCLUDE? 2 Sets of 10 different spy / secret agent clues plus winners card These clues are all different. No two clues are solved the same way. Some of the clues require players to use Morse code, some the cipher wheel, invisible ink, decoder disk, logic skills, riddles, fingerprint analysis, and more. When I first put out my spy treasure hunt I had so many requests for clues that were either easier or harder. So now I have included 2 different sets of clues, one more difficult than the other so that you can decide which one is best for your players. The clues are also interchangeable so you can mix and match! NOTE: Each clue measure 5x7 and two clues print out per page. Morse Decoders: Some of the clues use Morse code. We include a Morse Decoder with this hunt. This decoder along with the others can double as party favors so that after the hunt party guests can create their own top secret messages. Cipher Wheels: Our cipher wheel is always a huge hit. It is two circles that sit on top of each other. When placed in the correct position you can code and decode secret message. This is also shown and explained in the clue samples below. Clue Locator Key: Our Clue Locator Key comes in a editable PDF file. This enable you to type in whatever locations you want to use in your hunt. You can also print it off and write in the clue locations if you prefer. This is one of the things that make our hunts so unique and enable you to hide your clues in your chosen locations. Easy step-by-step Set-Up Instructions: In this simple to follow guide we walk you through step by step how the hunt works and how easy it is set it up. Answer keys for both clue sets: This is in case players get stumped. A complete answer guide for all clues. Every clue in this hunt has a numerical answer between the numbers 1-30. When the player figures out the answer to the clue they look up that number on the clue locator sheet ( image shown on left) to determine where there next clue is hidden. You will fill this sheet out beforehand, this is where you write or type in all the hiding locations. There is an easy hiding guide included to instruct you how to do this. Basically if the answer to a clue is number 9. Then on the key locator you would write the location you hid the next clue next to the number 9. There are only 10 hiding locations needed. The rest should be filled in with decoys locations. Above are two sample clues from the easier version of the hunt. The first clue is actually the first clue in the actual hunt. It gives a quick introduction to the hunt and includes the place where players will find their first clue location as well. The orange letters spell out LOCATION THIRTY FOUR. 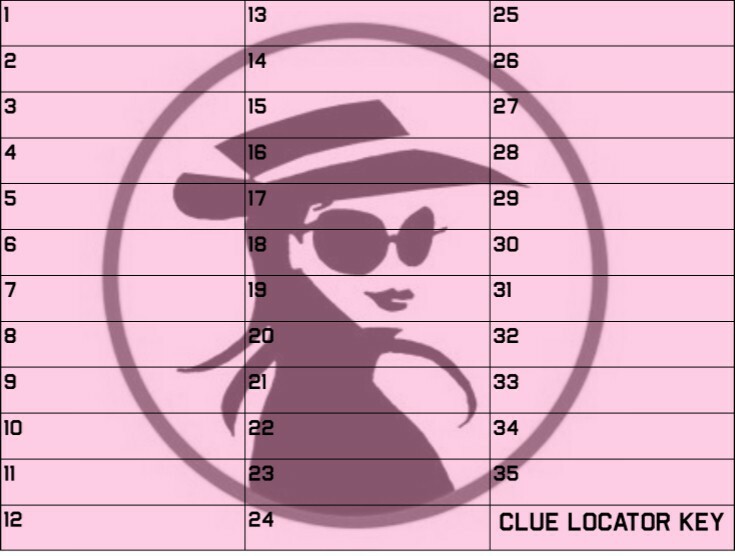 Players would look at there clue locator guide and see what location is written in spot #34. This is where there next clue will be. This clue is also the firtst clue in our harder hunt, it is just in code. The second sample clue is a maze. Once the players find their way through the maze the letters they pass along the way will spell out TWENTY THREE. This is where they will find their next clue - location #23 on their clue locator key. 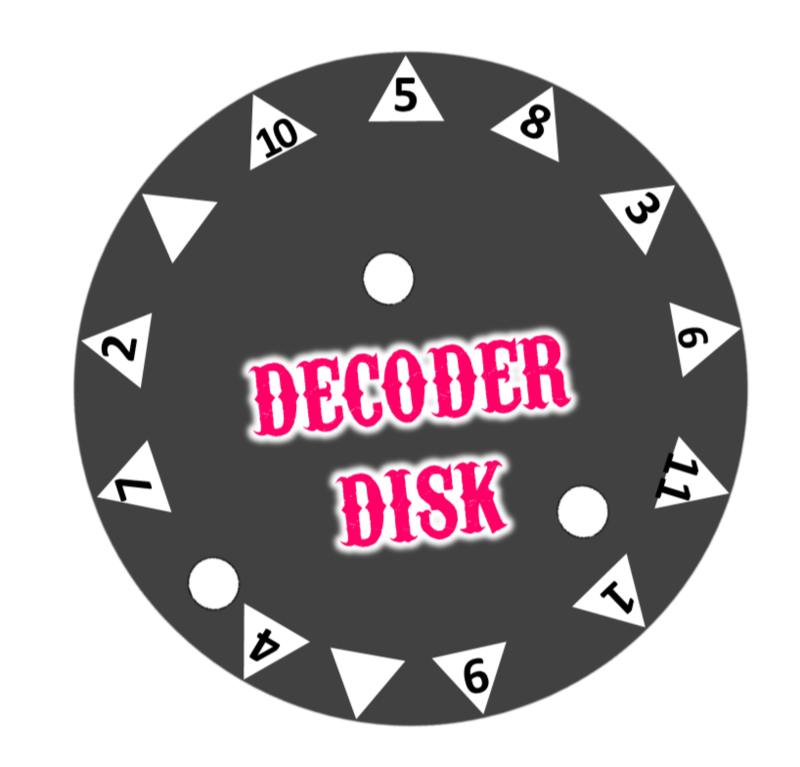 In the first clue above players will need to use their decoder disk (shown on right) to solve the puzzle. The decoder disk comes with the hunt. You just print in out and use a hole punch or sciccors to remove the white circles. Players use it by simply lining up the correct points to the point on the clue. Each point reveals a different letter of the answer. 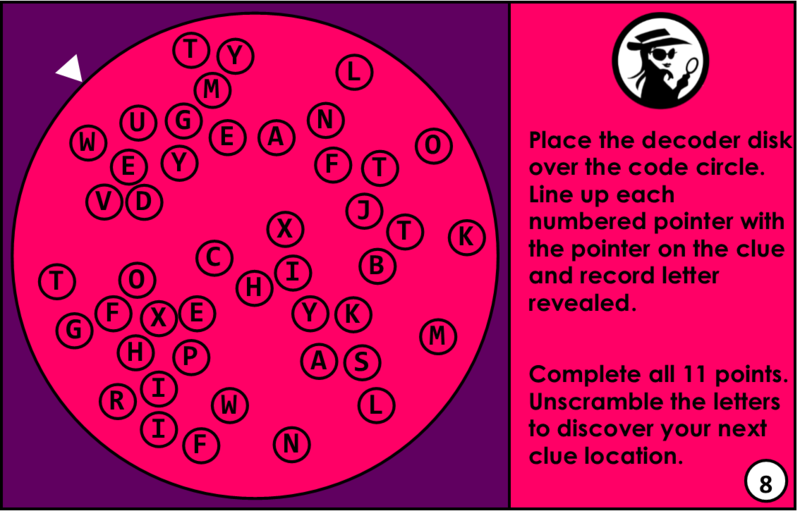 Once all letters are discovered players unscramble the letters to discover their next clue location. The second clue is a word search with a twist. 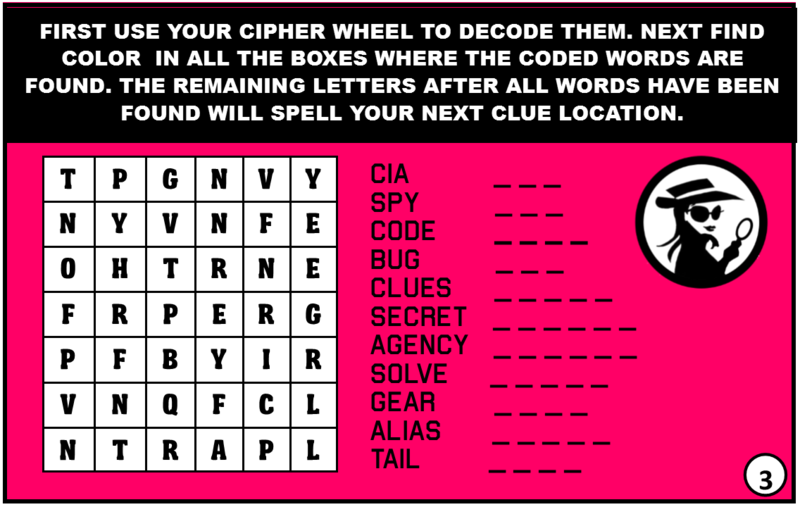 The players must use a different decoder to solve this clue - a cipher wheel. This also comes with the hunt. 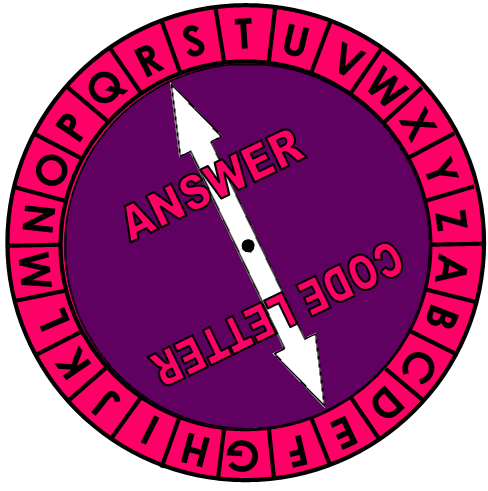 It is two circles that you cut out and place the small purple circle over the larger pink circles with the letters around it. 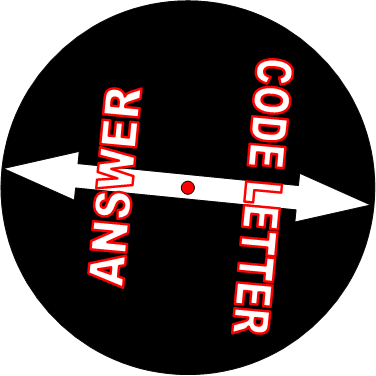 You move the circle around to determine which letter is code for another. Players first put all the words shown in code, then they find those words in the word search and mark them off. The remaining letters in the word search will spell out their next clue location. Kids LOVE how cool the decoder disk and the cipher wheel are. After the party they can use them to create their own messages! These also make excellent party favors. Where can this hunt be played? That’s one of the best parts. This hunt can be played anywhere (indoors, outdoors, ANYWHERE!). this is because YOU decide where the clues are hidden. See Key Locator description above for how this works. Is this a cooperative game or can it be competitive? 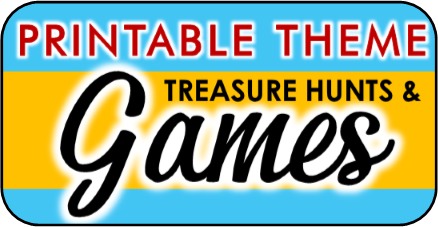 You can play this treasure hunt as either cooperative (all players working together to reach the treasure), or as a competitive game (players are divided into smaller teams or individuals and they complete with each other to be the first to the treasure). You could also choose to play in small teams or individuals but have a treasure for each so that everyone wins. If you want to play with competing teams instead of one cooperative group you can simply print out as many copies of the clues as you have teams and hide each teams set of clues in different locations from the other teams. This means that even though each team would be solving the same set of clues they would all be leading to different locations and they all have different Key locators. What age is the secret agent / spy treasure hunt suited for? 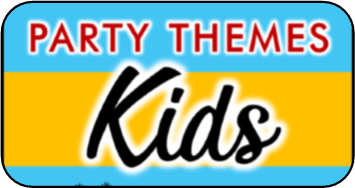 This hunt is geared toward ages 6 – 13. Players need to know how to read and how to add and subtract. How long does it take to receive my hunt once I order? Once you have completed your order you will receive an email link that lets you download your printable secret agent / spy treasure hunt INSTANTLY! How do I receive my hunt? The download that you receive comes in a ready-to-print PDF file. What is the best way to print this hunt? You can print your hunt at home, or at your favorite local or online print shop. I suggest using card stock over standard printing paper simply because he produces a sturdier product with a higher quality look and feel.